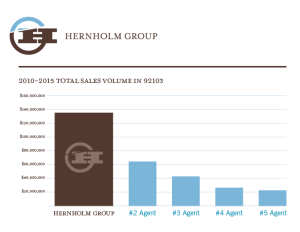 The Hernholm Group is a family real estate team who has been the #1 producer in the 92103 zip code for 18 years. The chart below reflects single-family home sales from 2010-2015 by the Top 5 agents in this zip code. Click the graphic to enlarge. Last month many of us in Pt. Loma noticed something different: planes overhead. To many who are reading this, that might seem like a ridiculous statement given that planes have been flying over Pt. Loma for decades. However, eastbound planes were no longer following their typical departure routes: over Loma Portal to the Pacific Ocean, then turning south and proceeding past the end of the Point. Instead, because of the increase in “the fan” for the departure routes, planes are now taking off more frequently and departing over neighborhoods south of Nimitz (Fleetridge, Pt Loma Heights, and Ocean Beach). Rather than turning around after passing south of the Point, planes are flying back over the populated areas of the peninsula. Many of us took to the internet to question what we were observing. Posts on our neighborhood NextDoor app were becoming more and more frequent regarding increased airplane flyovers, departure frequency and noise. No record of a formal announcement from the FAA or the Airport Authority could be found. No notice of a public process from local government officials had been announced. Yet there was no denying that planes were flying over neighborhoods that had never experienced air traffic/noise. Just after Labor Day 0ur grass root efforts took off (pun intended). A Facebook group formed (Pt. Loma Air Route Forum) and within a month over 1000 members posted contact information for government officials, articles about NextGen, evidence of new flight routes, et al. We flooded the Airport Authority with noise complaints via phone and email. The Airport Authority’s generic auto response indicated that even they had not been informed of the FAA’s intentions in regard to NextGen. 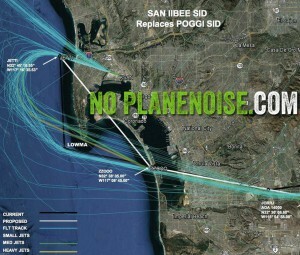 Our website, noplanenoise.com, was gaining traction and quickly became a resource for getting up to speed on what was happening at SAN. 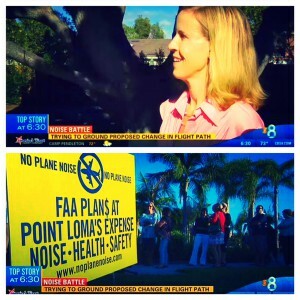 In conjunction with Assemblywoman Zapf, Congressman Peters and Mayor Faulconer and a multitude of media outlets (KUSI, Channel 8, Fox 5, Channel 7, 1170AM, KPBS), we galvanized a strong voice in opposition to the FAA. Over 1000 community members attended our town hall meeting at Liberty Station on October 6th. At the time of this meeting, over 3000 residents had signed our petition, which was handed to an FAA official (as of 11/1/15, the number is 3685). San Diego was not the first city to be victimized by NextGen and will certainly not be the last. Communities all over the country are attempting to thwart FAA’s rollout of NextGen via #NoFlyDay. Minneapolis successfully halted the FAA’s encroachment on their airspace while the city of Phoenix is in the midst of a lawsuit against the FAA. In some cities, such as San Diego, the FAA identified the purpose of NextGen as an annual fuel savings of $7.8M. However, the numbers don’t add up as that $7.8M savings is divided between 21 regional airports in the SoCal Metroplex. The savings add up to around $5 per SAN departure or arrival. With that agenda exposed as irrelevant, “efficiency” becomes the name of the NextGen game: schedule as many departures and arrivals as possible to increase airline profit margins. Adding insult to injury, we have discovered that NextGen is exempt from any environmental, health, financial and, most importantly, safety review thanks in large part to Senator Charles Schumer’s (D-NY) efforts in 2012. 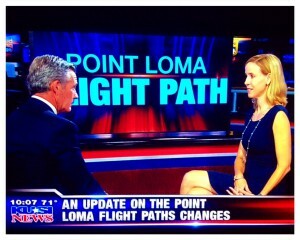 San Diego is unique and fortunate in that its eastbound departures have, for the last 50+ years, departed directly over Loma Portal and then turned around over the Pacific Ocean around what is identified as the LOWMA waypoint. To propose that broadening the departure fan and then flying back over the peninsula (versus south of the Point and over the ocean) has no safety, environmental, health or financial impact is preposterous. While the FAA attempts to assert its dominion of the skies, here on the ground, Pt. Loma is home to two major military bases, Ft. Rosecrans national cemetery, Cabrillo national monument, Pt. Loma Nazarene University, a multitude of elementary schools and a large residential population. The environmental impact alone demands years of research, especially given the children living and being educated immediately under these new routes. What is more, there are officially protected species that reside within Ft. Rosecrans and the adjacent national park. Lastly, taking into account the incredible, and lasting reduction in property values that would ensue as a direct result of NextGen, San Diegans will suffer county-wide given the billions in projected property tax revenue losses over the next decades. 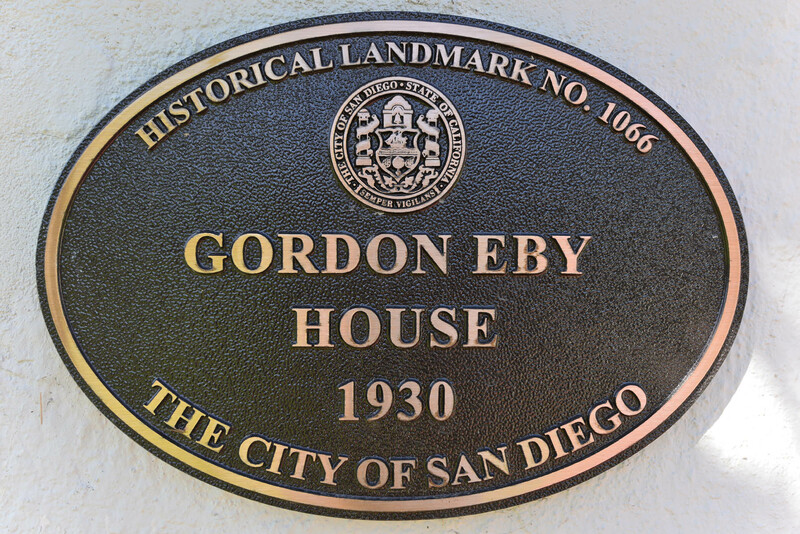 One of the most sought after property types in San Diego’s older neighborhoods is “historic.” Not only do such homes often showcase over a century of character, charm and architectural integrity, but they can also afford their owners a financial benefit referred to as the Mills Act. With property prices on the rise in America’s Finest City, historically designated homes with the Mills Act have become even more desirable in light of the property tax savings they provide owners. 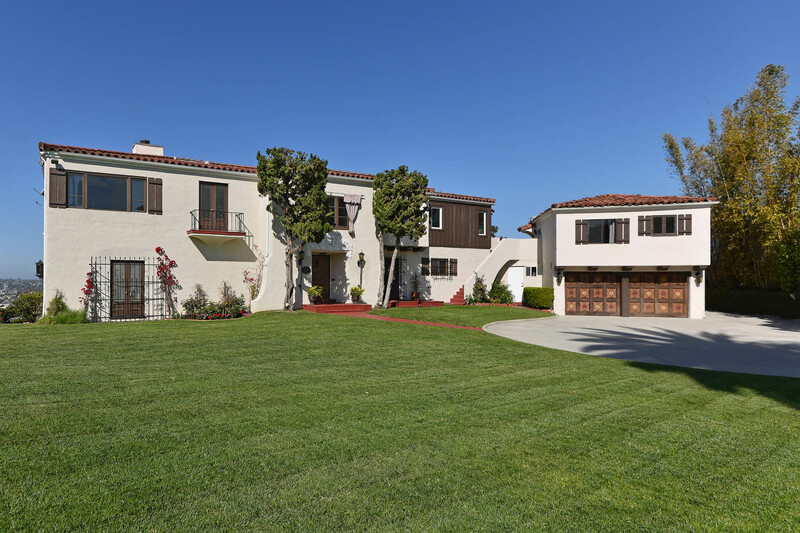 For example, our listing at 2335 Juan Street is currently listed for $3,780,000 and would otherwise result in annual property taxes totaling around $40,000 at the time of sale. With the Mills Act in place, the next owner would pay a much reduced amount closer to $11,000. Another example of Mills Act savings is the Historic Starkey Estate at 21 F Street which we currently have listed for $1,590,000. Annual property taxes for this 2-acre property total $4,574 in 2016. The logic behind the Mills Act is that owners will use their property tax savings to help rehabilitate, restore and maintain their historic homes. The Mills Act is the single most important economic incentive program in California for the restoration and preservation of historic buildings by private property owners. 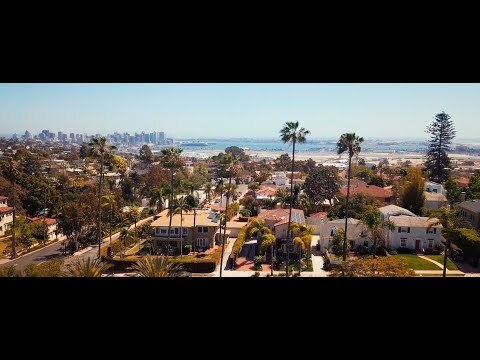 There are many questions surrounding older homes in neighborhoods such as Mission Hills, Bankers Hill, Coronado, Point Loma and La Jolla. Many do not realize that applying for a historic designation and obtaining the Mills Act are actually two separate processes. As such, you will sometimes encounter a historically designated home that does not yet have the Mills Act in place as in the case of the iconic estate at 2121 Sunset Blvd, designated the Berth P. Mitchell House. 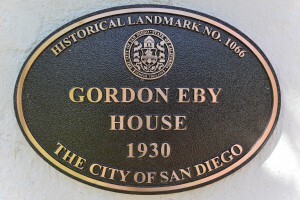 We are often contacted by both buyers looking for historic homes and by homeowners wanting a better understanding of the pros and cons associated with historic designation. Some historic homeowners opt not to pursue the Mills Act as their property tax basis is already so low given how long they have owned their home. The more often asked questions are: How does one get their home historically designated? How much does it cost? How long does the process take? Once designated, how does a home owner then apply for the Mills Act? For the more home-specific questions such as “Is my home eligible for historic designation?” or “Can I add a second story once my home is designated?” we often refer clients to our contacts at the Historical Resources Board. Historic homeowners are the guardians of many architectural eras from the Richard Requa residences of the 1920s to the Homer Delawie dwellings of the 1960s. 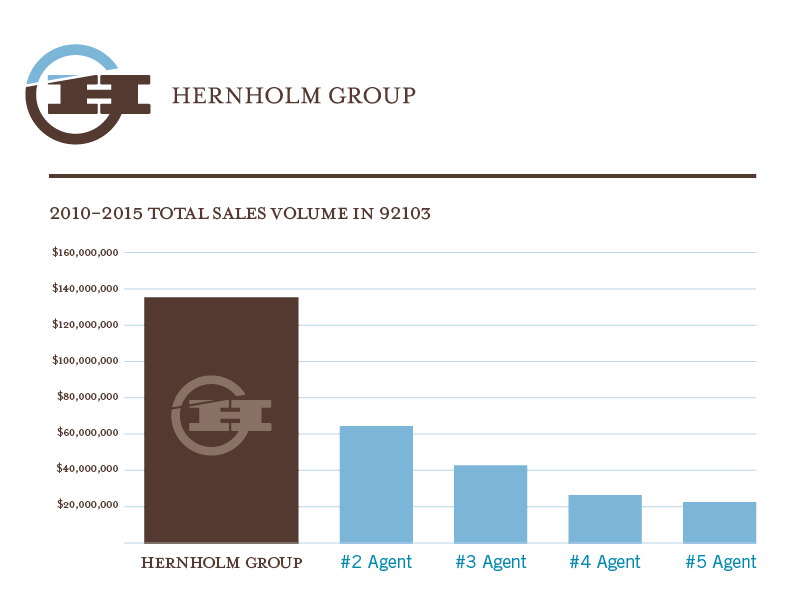 The Hernholm Group is therefore privileged to have represented over 100 historic home sales – more than any agent in San Diego.